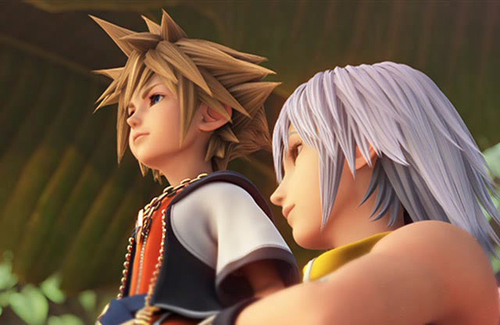 Unfortunately, no surprise announcement on Kingdom Hearts III was made at TGS 2014. However, in an interview conducted by Famitsu Weekly, Tetsuya Nomura confirmed important (yet generalized) information regarding the progress on Kingdom Hearts III. Translations of the Famitsu Weekly Yasue interview by Justin. Any and all misinformation regarding to the addition of “Frozen” as a world in Kingdom Hearts III stated by Tai Yasue have been denied and no confirmation of the worlds were stated. Increasing the availability of options of each new KH3 world will be something we want to focus on. This means the world scenario is a basic layout of two minutes on paper, and we want to give players a chance to explore the worlds more. The expansion and fun in KH HD 2.5 ReMIX, KH3, and Kingdom Hearts [chi] will be a heavily considered attribute for Kingdom Hearts III. The scenarios of both Kingdom Hearts [chi] and Kingdom Hearts III are closely related. KH3D [Dream Drop Distance]’s game mechanics will have a close relationship to the gameplay integrated into Kingdom Hearts III. The progression schedule for Kingdom Hearts III is going as planned. We [the team] are struggling to fitting the PlayStation 4’s engine (through the use of the “Kingdom Shader”) with the character designs and environments in KH3. Also, Sora and Riku have new costume designs. Collaborations with the Osaka team have mentioned Sora (in his final growth stages) felt too “sky-high” and invincible in development, meaning they are balancing out the strengths and mobilities of playable characters. Keyblade design variances first introduced in Kingdom Hearts 2 Final Mix+ through “Lingering Will” and Birth by Sleep look brilliant and will be an essential gameplay mechanic for KH3. Kingdom Hearts III has a lot to be done before a reveal. But, Nomura-san will reveal more later on when the time is right. This is pretty amazing information, finally getting confirmation of the link between Kingdom Hearts [chi] and Kingdom Hearts III and that Sora and Riku have new character designs for the next installment. Even though more on Kingdom Hearts III is yet to be revealed and worked on, Tetsuya Nomura’s direct interview with Famitsu Weekly will continue on in the next issue. So sit tight everyone and make sure to stay charged with us at KHRecharged!